along with some observations on related subjects. After CBS bought Fender in 1965, management concentrated on increasing production and reducing costs. They believed that they had a "cash cow", and they were determined to milk it. Occasionally decisions were made that improved quality, but they were rare. By 1981, the buying public had firmly established the term "pre-CBS Fender" as the legendary standard of quality. CBS management knew they were in trouble, so in 1981 they hired Bill Schultz as President, Roger Balmer as VP, and several others from Yamaha USA, in an attempt to turn the company around. Their 5 year plan included a commitment to quality, and an increased investment in R&D. Shortly after my old friend Paul Rivera was hired as marketing director for Fender amplifiers, I joined the team and was assigned to work with Harold Rhodes on the next generation Rhodes piano. Steve Woodyard, a master Rhodes technician, completed the team. Interestingly, Harold was not a Fender employee, and had no official title or position. So, at least in theory, we all outranked him. This put him in a very strange position. He had no formal title or power, but through the force of his personality, and his reputation, acted as de-facto CEO. Everyone knew that electronic synthesizer technology was advancing rapidly. The classic Hammond tonewheel organ had been discontinued, and we all believed that it was just a matter of time before the Rhodes would be obsolete. You have to give Bill a lot of credit for believing in the Rhodes. Many people said that the piano was already obsolete. And many of the old-timers still remembered the expensive failure of the Mark III EK-10. But...we were still given the funding and support to create one more version. We believed that the biggest weakness of the piano was its weight. I remember my early days working with bands, lugging the thing up and down stairs. I knew exactly how cumbersome it could be. We also wanted to improve consistency. Some pianos were prized as "magic", others never sounded quite right, no matter how much anybody tried to adjust them. Part of our job was to analyze the great ones to find out exactly what made them great, and then use the knowledge to make them all great. I was originally assigned to work with Harold on his idea for a new, low profile version of the piano. He had the beginnings of a prototype action, but it was not yet playable. The idea was to use what Harold called the "dog leg" key to allow the top of the piano to be lowered, closer to the keyboard. This would make it easier for multi-instrumentalists to stack synthesizers on top of the piano and minimize the amount of hand motion when changing keyboards. Remember, this was the era of the multi-keyboardist. Modular systems, consisting of many keyboards were emerging as the dominant style. To accommodate that style, we decided to eliminate the suitcase version. The piano of the future would be connected to a mixer, and a separate amplifier, and be part of a multi-keyboard stack. This philosophy also drove the design of the stand. We could no longer assume that permanently mounted legs would always be desirable. A separate, modular stand made much more sense. Remember, we were designing the piano as a component of a multi-keyboard setup, so a separate, universal keyboard stand seemed to make sense. 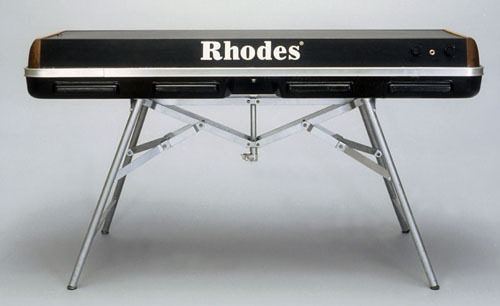 Also, in the traditional Rhodes design, the legs were stored in the case lid during transport, this increased the weight. And we were on a mission to remove weight. The stand was designed to be conceptually similar to a cymbal stand. It relied on riveted joints and triangulation for its strength. And strong it was. We even thought about putting a car on it to show its strength. We debated adjustability a lot. Some argued for some kind of extendable leg, I argued for a simple, fixed piece of tubing. Those who favored adjustability argued for the need to accommodate different sizes and styles of players. I argued that it was hard to make a solid, rigid, extendable leg. Extendable legs tended to be loose and wobbly. They were also expensive, and we were trying to reduce cost. We eventually decided to make the stand a fixed size, at the standard playing height of a grand piano. When seated, players could adjust their seats to optimize their comfort. We also designed a set of extensions to allow for standing while playing. These were never produced in quantity. I think Chick Corea got the only set. Along the way, I was temporarily reassigned to another project. After CBS bought ARP, we were stuck with a large inventory of ARP electronic pianos. I was assigned to "put some lipstick on the pig" to make it look nice enough to sell. 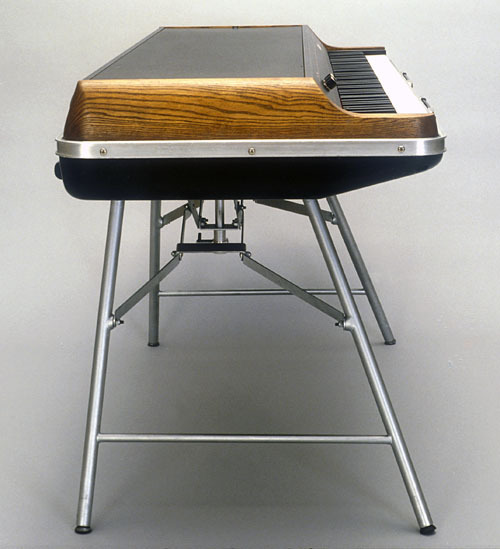 Evidently, the original ARP piano was considered by marketing to be unacceptably ugly. Since Fender was a guitar company, we had lots of big, thick chunks of wood readily available, so I used some to re-package the ARP as the Rhodes Electronic Piano. The concept was simple. People, especially artists, love wood. 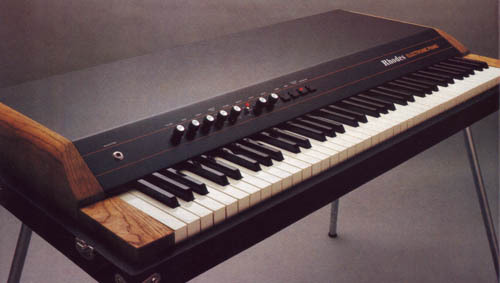 Many other synthesizers included wood, but it was thin. I thought that a big thick chunk of nice wood would draw the eye away from the boring metal and tolex. Marketing loved the redesign. Everybody else was upset. The ARP guys complained because my original design required them to modify their existing stock of internal parts, in order to fit the new case. They eventually put up so much of a stink that the design was changed to accommodate the unmodified parts. In case anybody was wondering, that's why the cheek blocks ended up so wide. Harold was especially upset that they put his name on it. I think they finally managed to sell the lot, but it never achieved any respect in the musical world, and we promptly forgot about it. Harold and Steve spent much of their time supporting production of the Mark II, which was still being produced at the time. They assisted the factory when production problems occurred, and unfortunately, they occurred frequently. Lets venture into the wacky world of manufacturing for a moment to try and appreciate the problems we faced. Almost no manufacturer makes all of its parts in-house. Most rely on a network of vendors to make the various parts and subassemblies. In the early stages of the piano's development, Harold worked very closely with these vendors. Many of them were small shops, and Harold frequently worked with the owner, or master craftsman. This was a very informal process. There were never detailed, formal specifications. The drawings were approximate at best. The mysterious, often secret, details of tooling, process and materials, existed only in the minds of the original producers of the parts. Unfortunately, our purchasing department was driven to reduce costs. They would frequently invite new vendors to bid on the production of existing parts. The new vendor would look at the drawings and say "this looks simple, I can make it, and I can make it cheaper than the last guy". But when the new parts arrived, they often didn't work quite as well. Seems that the new vendor never figured out all the little tricks that Harold and the original craftsmen developed. Harold and Steve fought those problems, almost constantly, for years. And, to make things worse, sometimes the problems didn't become apparent until a large quantity had already been produced. We were then given the option, "sign this order to scrap them, or find a way to use them". From tines to hammer tips and tone bars, to grommets and springs, almost every part eventually became troublesome. Here is one example. Hammer tips were made of rubber, and the standard way to specify hardness is by a measurement called durometer. The drawing specified only shape and durometer. But, after changing vendors, the tips sounded different, and wore out faster. Some little detail of the compound or processing was responsible. When we arrived, we were horrified to discover a rusty old drill press, wobbling on a uneven dirt floor, protruding through a hole, in a crude, rickety wooden table. The precision drill bushings in the fixture had been replaced with bushings having much larger holes. This made it easier for the operator to hit the target, as he drilled as fast as he could pull the handle. After we returned, Harold went into Bill Schultz's office to complain. Harold spent a lot of time in Bill's office complaining. He loved his piano, and became very upset when he saw it being treated with such little respect. We were also assigned to reduce the manufacturing cost of the piano. Even though management insisted that quality was their primary focus, there was always the pressure to reduce cost. But what exactly did the piano cost to build, and how exactly would we reduce it ? You might think that this would be an easy question, but you would be wrong. It seems that Fender used the "cost center" method of accounting. Each separate part of the process had its own costs. The wood shop, metal shop, paint shop and assembly lines were treated as separate businesses, each buying from and selling to the others. All cost data was stored on an HP minicomputer. Getting data out of the computer was tricky. We did not have web browsers and Google, we had to submit a request to the IT department to prepare a report. 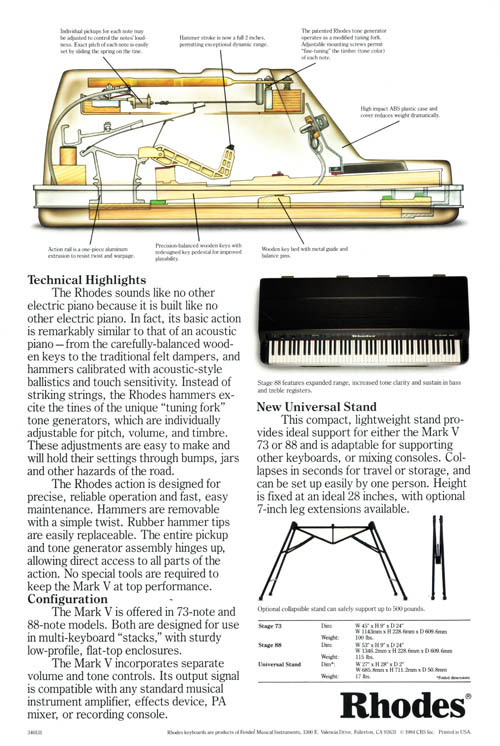 We couldn't ask for a report on "all costs associated with the Rhodes piano". We had to request by part number and cost center. A single part number could contain costs from several cost centers. For those of you who have never worked in manufacturing, I probably need to define some terms. Costs are calculated by combining parts cost, labor cost and overhead, also called "burden". Overhead is the cost of the building, electricity, management, R&D, and pretty much everything that is not labor or materials. At Fender, overhead was computed as a percentage of labor, a large percentage, typically around 780%. Even though overhead had no logical relation to labor cost, this is the way it was calculated. So, if the labor cost of a part was $10, the overhead was $78. The simple approach to cost reduction was to reduce the amount of labor hours. Whether by outsourcing, automation or process redesign, this seemed to provide the biggest gain. But unfortunately, this gain was an illusion. The more that labor hours were reduced, the more the accountants increased the overhead percentage. We never did find out exactly what the manufacturing cost was. As time went on, I was given almost total freedom to be creative. 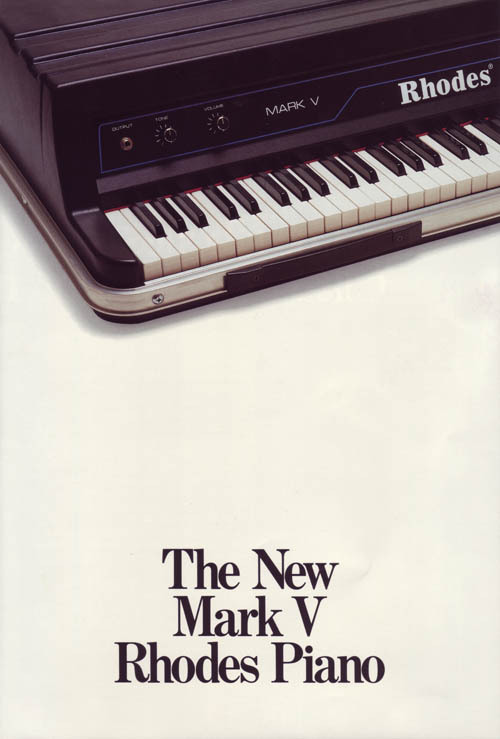 My project evolved into the creation of an all new piano, the Mark IV. Although it started with Harold's ideas for an offset action and lowered top, it ended up as a radical redesign. In addition to the low profile and reduced weight, I concentrated on the action and its dynamics. It was possible to adjust the traditional action to play soft or to play loud, but was impossible to get very loud and very soft with the same adjustment. 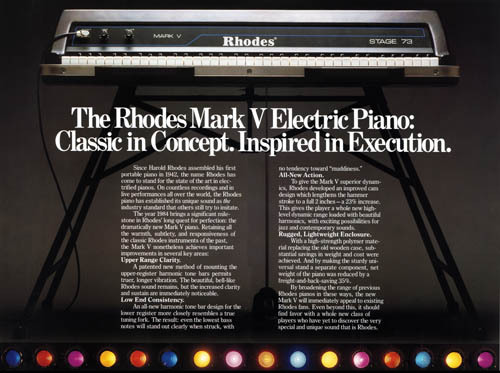 Compared to a grand piano action, the Rhodes action is deceptively simple. In a grand piano, the jack accelerates the hammer and then, at the end of the stroke, moves out of the way. This allows the hammer to strike the string cleanly, and rebound without bouncing off the jack. In the Rhodes action, the hammer is accelerated by the key. The felt at the back of the key presses against the curved section of the hammer, until the end of the stroke. Then the flat part of the hammer makes contact with the felt and acts as a brake, which is applied a fraction of a second before the hammer hits the tine. The hammer rebounds off of the tine, and has a natural tendency to bounce and strike again. The friction between the key felt and the flat part of the hammer damps this motion, although not perfectly. The unfortunate side-effect of this design is that at the end of the stroke, after the brake has been applied, the hammer is slowing before it hits the tine. This limitation is inherent in the Rhodes design and cannot be overcome. As part of our analysis, we obtained a 12,000 frame per second camera to observe the strike of a hammer on a tine. When the hammer struck the tine once and then stopped, the tone was clear. When the hammer bounced and struck the tine multiple times, a very unpleasant sound was produced. We called it a "spud" note. In the worst case, on a very loud note, the hammer bounced up to 6 times. After learning this, our focus turned to understanding and preventing bounce. The critical dimension was the distance from the hammer tip to the tine at the end of the stroke. Adjust it close, and you could play a very soft note, but if you played loud, bouncing would occur. If the gap was adjusted to be large, loud notes sounded clear, but it was impossible to play soft. Good tuners learned to compromise between the two extremes. I wondered, what would happen if the acceleration could be decoupled from the braking, and optimized separately. I developed a prototype action that looked nothing like a traditional Rhodes. It had a "jack" that was nearly geometrically identical to the jack on a grand piano, but instead of moving out of the way, it stayed rigid. The brake was separated, and instead of sliding smoothly, was applied abruptly at the end of the stroke. Because of the particular geometric relation between accelerator and brake, and the materials used, it was possible to produce an automatically self-adjusting action. When played softly, the tip stayed close to the tine. When played loud, the gap automatically increased. Everyone, including Harold, was very excited about the possibilities of this new action. In addition to the improved dynamics, the action felt more like a grand piano. In the traditional Rhodes action, the contact point between the felt at the back of the key and the curved part of the hammer moves during the stroke. In effect, the action gets heavier the further the key is pressed. By replacing the curved part of the hammer with a single contact point, the force became more constant during the entire stroke. Along with the action, the case was also redesigned. Weight was aggressively removed. The wood box was replaced with a vacuum formed plastic shell. The internal structure was completely redesigned using lighter aluminum extrusions and no wood frame at all. Both stamped steel and injection molded plastic keys were created. The offset shape was much too odd for traditional wooden key manufacturing methods. Key switches and interface electronics were added to allow the piano to double as a synthesizer controller. Since we had recently acquired the ARP company, we used the proprietary, pre-MIDI, Chroma electrical interface. In order to provide placement flexibility, a hydraulic sustain pedal was developed. 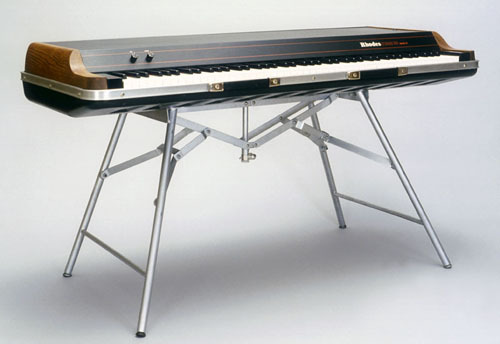 The idea was to be able to stack the piano on top of another instrument, such as a B3 organ. A flexible plastic tube allowed more freedom than a metal rod. We were not the first to try to develop a flexible sustain pedal. The Wurlitzer electric piano used a cable, but it felt terrible. As the cable bent, internal friction increased. Our hydraulic pedal felt good, really good. So good, that I even started work on adapting the design to a drummer's hi-hat. Unfortunately, as anybody who ever washed a motorcycle knows, hydraulics leak. The thought of carrying a bottle of brake fluid to a gig, and filling a greasy pedal, was too disgusting for most musicians. You might be thinking, "that's really strange, why would anybody design a hydraulic sustain pedal?" Well, at the time, we were trying to be as creative and unconventional as possible. We really wanted to do something special, to save the life of our piano. Wood still looked cool, so the thick wood sides from the Electronic Piano, along with its graphics and overall styling were adapted to the Mark IV. One prototype was produced. Although it showed great promise, there were problems. The weight reduction program succeeded at reducing weight, but introduced a serious side-effect. The various non-musical noises made by the piano mechanism increased dramatically. The traditional design made noise too, but the massive wood box kept it contained. The new, thin, lightweight case seemed to amplify the noise, almost like an acoustic guitar body. Of course, none of the noise got into the amplified sound, but when the piano was directly connected to a mixer in a studio, a nearby open microphone could easily pick it up. To my great disappointment, the action also performed below expectations. Although the early one key models felt excellent, when the full piano was completed it did not feel as good as we had hoped. It sounded great, and had improved dynamic range, but many players complained that the action felt sluggish. This was probably due to the use of a piece of energy absorbing foam at the end of the "jack", added to reduce bounce. I believed that all of the problems could have been overcome given time, but time was one thing we did not have. 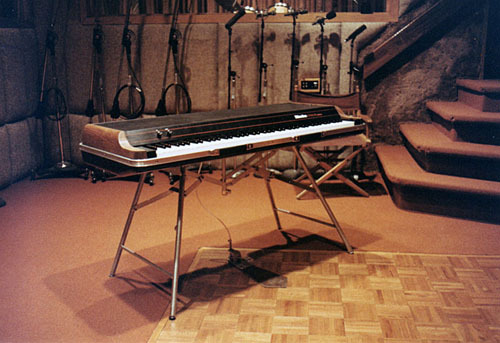 The Kurzweil sampled piano had been shown at NAMM, and we knew that time was running out. We needed a design, and we needed it soon. Devoting several more years to the perfecting of a radical experiment was just not possible. So, we switched to Plan B, the Mark V.
We took the parts of the Mark IV that seemed to work well, the plastic case and the stand. The stand was used as originally designed, the case was adapted to fit the traditional geometry of the piano. Unfortunately, the cool wood ends did not come along. We made a prototype with the wood ends, but when they were expanded to the dimension required to match the traditional geometry, they didn't look as cool. Since they would have been much larger, they would have been expensive. Remember that we were still required to reduce costs. Steve and Harold took what we had learned during development of the Mark IV action, and used it to improve the traditional action. The curved part of the hammer was moved closer to the axel. This reduced sliding friction and made the action more linear. Additional plastic was added at the back of the flat surface to increase braking performance and reduce bounce. And finally, the hammer throw was increased. Just in case you were wondering...the hammer throw was reduced in the Mark II in order to minimize warranty costs associated with broken tines. It was not done to improve quality. We returned to a wooden keybed. Did I mention that people, especially artists, love wood? In case you haven't guessed already, the plastic keys on the Mark II were another attempt by the previous designers to reduce costs. Ironically, they were very difficult and expensive to design and manufacture. Plastic parts of that size and shape are difficult to make accurately, and they tend to warp. The development required time, expensive molds and lots of process tweaking. Considering development costs, I wonder if they actually reduced the cost at all? While I was busy with the Mark IV, Steve and Harold had been busy studying dimensional details. Their extensive research had shown where the critical dimensions were. It turns out that in some cases, as little as 0.010" of error affected the sound. For those of you who don't know, 0.010" was considered by many to be a precision metalworking tolerance. Woodworkers typically "use the big marks on the ruler". Various other little improvements were made. The tone bar screws were changed to countersunk flat head. A new countersunk rubber grommet was designed to more precisely align the tonebar. Stiffening ribs were pressed into the dampers to improve rigidity and damping performance. The Mark IV action rail was adapted for use on the wooden keybed, to more precisely control the critical dimension between the keybed and hammers. Because of the peculiarities of the aluminum extrusion process, the critical dimensions on the classic action rail were very hard to control. When we were done, everybody loved the prototype. 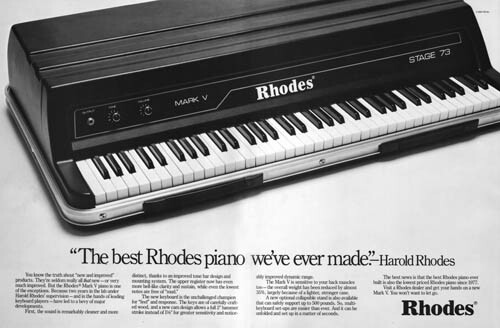 It really was the best Rhodes ever. Then we released it to manufacturing. Unfortunately, manufacturing still wanted to use their old sloppy methods. We argued endlessly about the need to maintain tolerances. In some cases we succeeded, but we did not win every battle. I remember going into the metal shop, and looking at a drilling fixture. I explained that the design they had chosen could not properly maintain the tolerances we required. Their answer was "why bother spending more money on new tooling, there won't be any more pianos once this run is finished". Although the prototypes were great, the production plastic case never did fit quite right, especially at the "cheek block" section on either side of the keys. During development, we had established a good relationship with a plastic vacuum former, who worked with us to develop the prototypes. We worked closely with the owner of the company, and he really put a lot of time into getting it right. But, when production time came, purchasing gave the job to another company. In the end, the Mark V was much better than previous versions, but the production models did not meet the standards, or perform as well, as our hand-made prototypes. We had succeeded, but were still somewhat disappointed. The pianos could have been so much better, if only the production group would have shared our passion. If I remember correctly, the production run was 2500 units. All production units had 73 keys. A single hand-made prototype was produced with 88 keys, but was never mass-produced. A hand-made prototype was fitted with a custom MIDI interface for Chick Corea. He used it on the Elektric Band project. Soon after the run was complete, CBS sold the company to a group headed by Bill Shultz. They closed the Fullerton plant, and discontinued the piano and the Rogers drum line. The new Fender decided to concentrate on guitars and amps. Bill managed to restore Fender to greatness, and we all respect his success. If only he could have done the same for Rhodes. I left Fender in 1985, and helped Paul Rivera start his amplifier company. I have since worked in a variety of industries, on a wide variety of successful projects, but I will always remember my time with Harold and Steve at Fender. I wrote this article from memory in 2006. I did not keep notes at the time I was at Fender. Memories get fuzzy after 23-26 years, so I may have made some mistakes. I do believe, however, that most of the stuff I wrote is accurate, if opinionated.